[News] - MediaPortal 1.15.0 Pre-Release ready for testing! Discussion in 'News and Announcements' started by high, May 21, 2016. We've just uploaded our latest 1.15.0 Pre-Release to Sourceforge! Hello, can i use this code for movingpictures to ? Or is there a way to add this in movingpictures also? MovPics needs to add support for this so best to ask in MovPics thread. 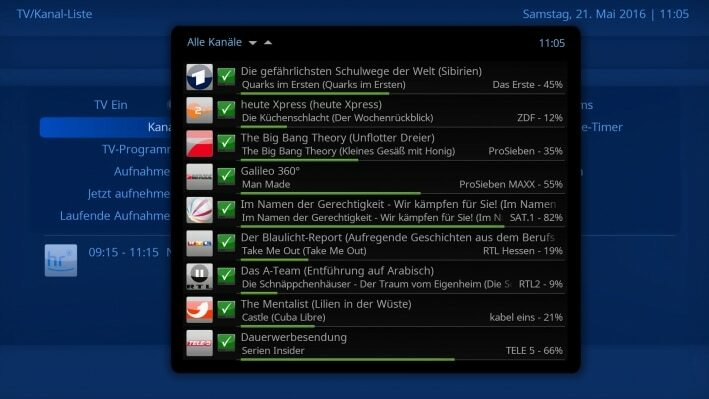 I see that you have added a progressbar to the TV-miniguide, can you then change the percent number in the TV-miniguide to actual time when the program ends. Because the percent doesn't say anything when the program ends, if the program have been on for 50% you dont know if its 5 minutes or 1 hour left of that program. Nice feature with the progress bar........ But that big green Checkbox is just so damn ugly! Either get rid of it or redesign it to moderne standards. Kind words as always to the skin developer giving up his personal time for free ! I appraised the new progress! - but I'm sad to see why the development/skin developer(s) did not look at the full picture before starting to change the code itself. Much more efficient that way - should not be that big a job to find an code alternative when you already have yours hands on the code. It does not happen with 1.14.0. This indicates that there is most likely a problem with a plugin. Can you try to disable or update your HTPC Info plugin?